Personally, I find that little tiny dot virtually useless. It’s difficult to see for folks with bad eyes like myself. I would love it if there was a way to highlight the whole filename with the color instead of the dot. 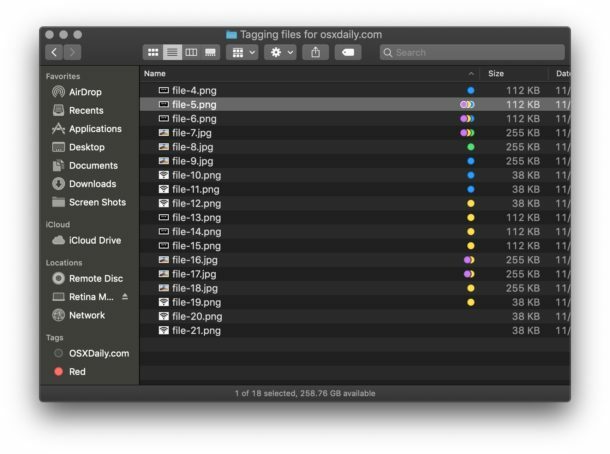 Use XtraFinder by trankynam for whole filename highlighting. 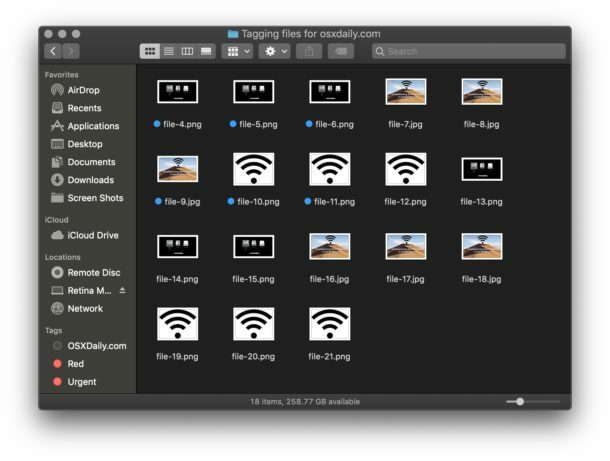 There’s a new Mojave beta of XtraFinder available, and you only need to disable System Integrity Protection for the installation, and then you can re-enable it. The tagging system itself is great. You can create as many proprietary tags as you want, and if you use the right naming scheme, namely “com.apple.metadata:MyTag”, then even Spotlight will pick it up. But you can also tag it with e.g. “local.michael_s.office-documents”, but then Spotlight will ignore it. Fantastic recommendation! Thanks Joss. You’ve made my day with this suggestion. Unfortunately, on Mojave, the setup of Keyboard Shortcut for Tags… no longer works. Still works for me. Maybe it is the key combination that you use. Really? I tried everything and nothing works for me, too. 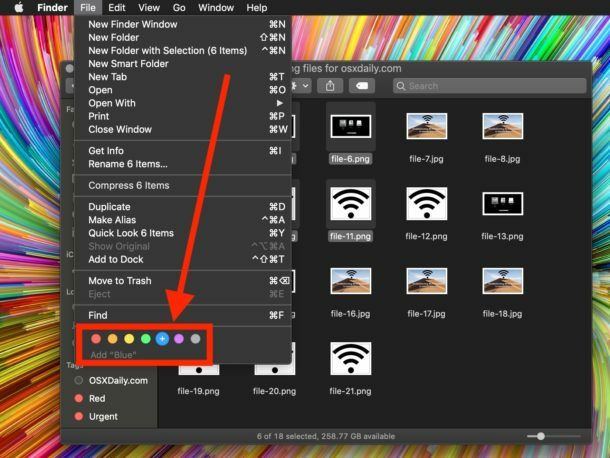 How did you manage to let this feature work in Mojave? I use tags to drive my filing system. I use “Downloads” as an inbox, saving new files with one or more tags that are then used to automatically move files to where I want them. The “move” part can be done with Automator but I prefer Hazel from Noodlesoft. to use tags on the same way … with one color for the same date or something else? Running Mojave, Macbook Pro 2016. I’ve tried removing a color tag with the method you mentioned and it won’t remove it. 1. 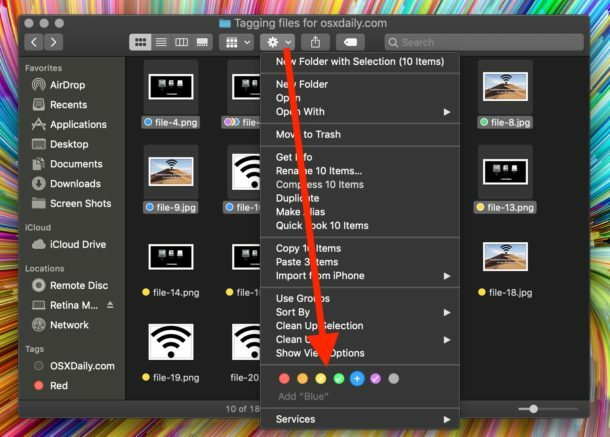 Right click doc, hover over color icon in list row and when ‘remove “[color]”‘ comes up with the ‘x’, click – nothing changes. 2. Right click doc, hit tags, the color tag shows in the list box, I hit delete, nothing changes. Also tried hitting delete then return (as per recommended in another forum).